The Day of Life period is from March 1 to 16, for the Christian Gospel Mission (CGM). 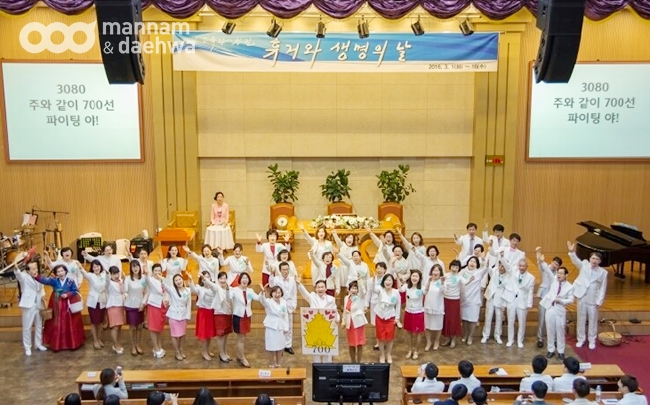 Throughout that period, the CGM churches in Korea are offering a special prayer condition. Additionally, each Church is giving glory to God as freely they want, and spending this period with overflowing love and thanksgiving. On March 16, the last day of that period, a national dawn prayer assembly will be held in each church at 4am. It will be a service of passionate prayer and worship. ▲ On March 13, the Family Department and Joy Stars Department gathered and gave glory to the Trinity with a special song for the offering segment of the Sunday service in Daegu.